Spring and Fall migration get all the press. After all, songbirds like warblers or goldfinches traveling in spring look spectacular and move in large numbers. And they can often be seen in our own backyards. But migration continues throughout the year, with different species of birds migrating at different times. In summer, many shorebirds start their migrations south – some having left their overwintering grounds in February. Usually the birds who were unsuccessful breeders that year leave early and take their time going back south. Since shorebirds don’t move in family groups, generally the adults which successfully raised chicks will leave mid-summer and the chicks will stay on their own for a couple of additional weeks to get stronger in their flight skills. Shorebird migration can often be shockingly arduous, with some shorebirds traveling from the southern portion of South America to above the arctic circle to breed, and then back again for overwintering. Some songbirds make this kind of trek, but shorebirds who nest in the far north have some fairly unbelievable non-stop migration statistics. For example, Bar-tailed Godwits are believed to have the longest non-stop migration – traveling 6500 miles from Alaska to New Zealand – yes that is non-stop! And they are not the only shorebirds who fly for days at a time without stopping. 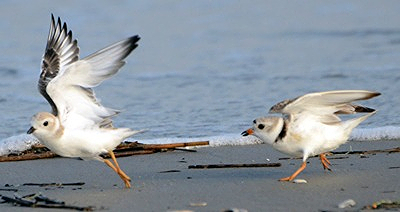 Migration can be very tough and shorebirds who migrate south in the summer have the advantage of being able to take their time getting back to where they will spend the winter — which may be a welcome relief after a hectic season raising a family on a busy beach.